I want a new camera.. and pretty sure husby is working on this as my Christmas gift! found my phone for me.. under my car.. thankfully I didn't run it over! It was on vibrate . fell out of my lap when I got out of the car and being the garage was coming down at the same time.. I didn't hear it fall. I searched and searched.. and remembered that app I installed. It showed exact GPS.. which didn't really help.. but it rang when it was on vibrate . and that did it! They have this for iphones too! And I can't forget my beloved..
Love it.. Love it.. Love it.. I recently just got hooked on this show.. Its good! Really good! I have many.. here you go! The Glamorous of a French Housewife on Facebook! What is a TV show or Movie or Song you could listen to or watch over and over and over and never get tired of…feel free to name one of each. 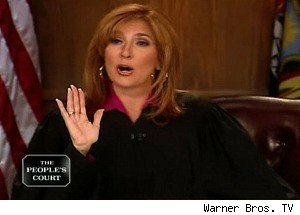 I could seriously watch the Peoples Court all the time! I can't explain how much I love this song. The drums are amazing.. his voice amazing.. the song is amazing!!! I love it!